What a perfect time of year to pick up this book! Small, concise and great for gift giving, 33 Habits of A Really Good Man is an inspirational starting point for a New Year and a new life. Yvonne Swinson takes bits of wisdom gathered from her father over the years and combines them with quotes he loved. Some of my favorite thoughts included “Change Begins With Me”, “Don’t Take Offense and “Make it a Habit.” Each chapter is a value Bill Wells stood by and lived. I truly enjoyed this book and would recommend it it to all…not just fathers or men. It’s a power packed read with life lesson learned and an underlying message of love. 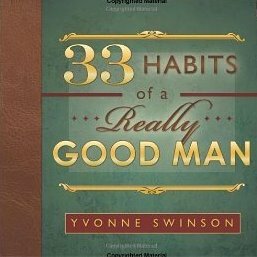 We are giving away a signed copy of 33 Habits of A Really Good Man donated by author Yvonne Swinson for our readers. Simply comment below to be entered to win. Giveaway ends February 4, 2011 and is open internationally. Summary: Mae Crawford’s always thought of herself as in control, but in the last few weeks her life has changed. Her younger brother, Jamie, suddenly has magical powers, and she’s even more unsettled when she realizes that Gerald, the new leader of the Obsidian Circle, is trying to persuade Jamie to join the magicians. Even worse? Jamie hasn’t told Mae a thing about any of it. Mae turns to brothers Nick and Alan to help her rescue Jamie, but they are in danger from Gerald themselves because he wants to steal Nick’s powers. Will Mae be able to find a way to save everyone she cares about from the power-hungry magician’s carefully laid trap? (quoted from goodreads). Book Summary: I met someone who changed everything. Matthias. My autistic sister’s guardian angel. Honest. Inspiring. Funny. Hot. And immortal. That was the problem. What could I do? I did what any other girl would do-I fell in love with him. Zoë’s sister darts in front of cars. Her brother’s a pothead. Her parents are so overwhelmed; they don’t see Zoë lost in her broken life. Zoë escapes the only way she knows how: partying. Matthias, a guardian sent from Heaven, watches over Zoë’s autistic sister. After Zoë is convinced he’s legit, angel and lost girl come together in a love that changes destiny. But Heaven on Earth can’t last forever. Book Summary from Goodreads: Seeing good and evil spirits is a gift Zoe guards with her life. Despite her guardian angel’s disappearance, Zoe forces herself to accept that she still has a purpose—but how does she carry the weight of her brother’s drug abuse, the hardship of living with an autistic sister, and a best friend who’s obsessed with a guy who only wants Zoe? She’s never felt more alone. When a mysterious spirit appears, Zoe thinks she has a new guardian angel. Instead, her brother’s addiction worsens, her parents are on the brink of separation, and her best friend tries to kill her. The spirit she thinks is her new guardian isn’t there to protect her: he’s out to destroy her family and seize Zoe’s soul. . . for Hell. Will Matthias’ return mean that he is Zoe’s guardian angel again? Or is their love the reason the jaws of Hell now gape open? Book Summary from Goodreads: Zoe’s secret is out. And the powers of Hell are ravenous to claim her soul. Her brother, Luke, knows her secret: that she sees both good and evil spirits. Her boyfriend knows. At least Matthias is her guardian angel again. But now Hell’s most ruthless leader will stop at nothing to have her soul. 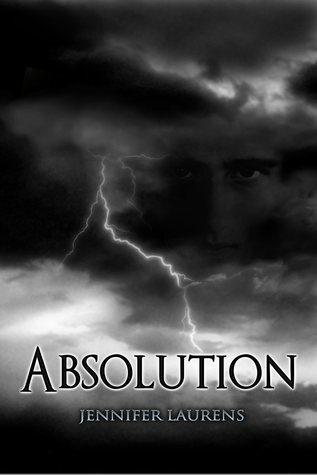 Albert, Matthias’ father, is relentless in his hunger for Zoe. He wants to destroy Matthias and will use Zoe to do so. The battle between Heaven and Hell tests everything Zoe has. As she witnesses everyone important in her life suffering, she’s brought to the ultimate choice: will she sacrifice her soul to save the ones she loves? Tell us a little bit about how the Heavenly Series was born. I’ve always believed in life after death, but the topic became more important to me when my 5th child was diagnosed with autism. I was left with too many unanswerable questions. As the years passed, I went through the grieving process, believing I’d “lost” a child. She’d never have friends, never love, marry and have a family of her own. The thought came to me that, maybe she’d find someone in the next life. Surely, if God loved her like he loves everyone else, he wouldn’t deny her? That was the nutshell idea that became Heavenly: that two people from totally different time periods could meet in Heaven and fall in love. Is main hero Matthias based on a real person in history? No. How do you think Zoe’s sister’s autism affects Zoe and her family? 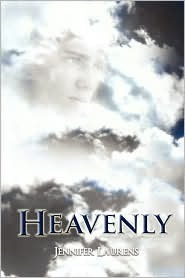 Since Heavenly is heavily based on my family, I know first hand how autism can take its toll on a family. Nothing is easy ever again. Even going on a walk has to be done in shifts. A child with autism’s behavior is so unpredictable, you never know what ( sounds, smells, sights ) will set them off into a tantrum, or some other kind of socially unacceptable act. My son, ( who Luke is patterned after ) dealt with her ( and other family issues ) by associating with kids who used drugs and using them himself. My daughter turned to partying and drinking. A handicap like autism with it’s erratic behaviors can create havoc. What advice would you give to teenagers facing similar trials and addictions? Personally, I believe that if you value who you are deep down, you don’t have to seek out self-defeating behaviors. In that vein, teens need to develop their gifts and talents, share them with others ( helping others always broadens perspective – something many teens need, characteristically living for themselves and for the moment as teenagers ) and having faith in a higher power. Being supportive of parents trying to do their best is vital to harmony in the family. What other books have you written? 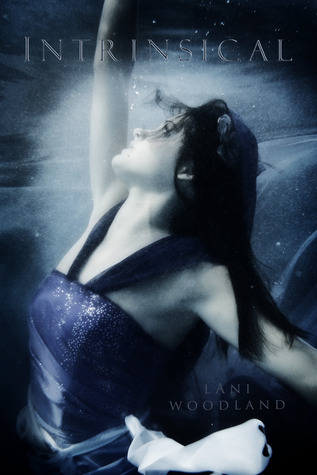 Falling for Romeo, Magic Hands, Nailed, A Season of Eden, An Open Vein, Heavenly, Penitence, Absolution and Overprotected. And a series of women’s romance novels. Any in the works? Yes, another YA paranormal due out next year. What message do you hope readers take away from your books? Hope when life is difficult. Love and miracles can overcome the most difficult of obstacles. Top three must reads… ohhh tough question. Reading is subjective. Can’t answer that one. She has kindly offered up one copy of one of her books for BIR2010. The winner may choose one of Heavenly, Penitence or Absolution and shipping on this giveaway is International. Simply fill out this form to enter. Ends December 15, 2010. Winners will be announced December 20, 2010. 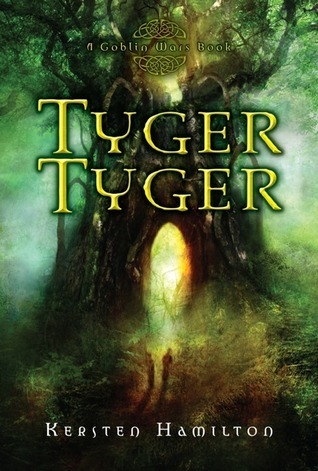 Teagan Wylltson’s best friend, Abby, dreams that horrifying creatures–goblins, shape-shifters, and beings of unearthly beauty but terrible cruelty–are hunting Teagan. Abby is always coming up with crazy stuff, though, so Teagan isn’t worried. Her life isn’t in danger. In fact, it’s perfect. She’s on track for a college scholarship. She has a great job. She’s focused on school, work, and her future. No boys, no heartaches, no problems. Until Finn Mac Cumhaill arrives. Finn’s a bit on the unearthly beautiful side himself. He has a killer accent and a knee-weakening smile. And either he’s crazy or he’s been haunting Abby’s dreams, because he’s talking about goblins, too . . . and about being The Mac Cumhaill, born to fight all goblin-kind. Finn knows a thing or two about fighting. Which is a very good thing, because this time, Abby’s right. The goblins are coming. 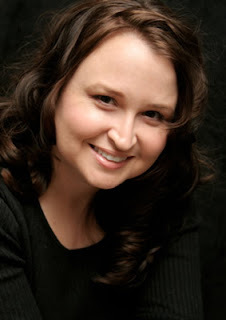 Kersten Hamilton is the author of several picture books and many middle grade novels. When she’s not writing, she hunts dinosaurs in the deserts and badlands outside of Albuquerque, New Mexico, where she lives. This is her first novel for young adults. 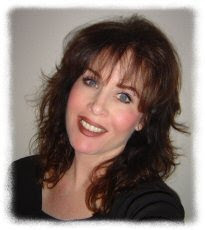 For more about Kersten, please visit http://www.kerstenhamilton.com/. Kersten has donated one copy of Tyger Tyger for our blog as part of BIR2010. The giveaway is open Internationally as long as the Book Depository ships to your country. To enter to win simply fill in the form below. Giveaway ends December 15, 2010 and winners will be announced December 20, 2010. Earlier this week I went out to my mailbox and there was this amazing package from Courtney Lowe at the Provo City Library. I had asked her for a couple of left over bookmarks from their Teen BookFest and she sent all of this….a new Children’s Book, “Los Gatos Black on Halloween” by from their upcoming guest speaker at the Children’s book fest in May Marisa Montes“, Scott Westerfeld’s “Bogus To Bubbly” plus all the items in the pack we are giving away below. Seriously cried when I opened it. Could they be any more kind over there? 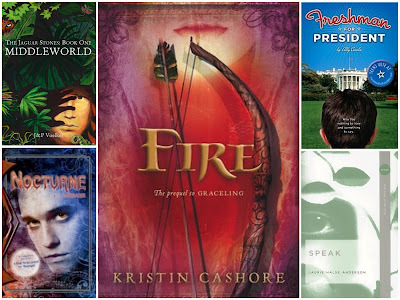 It’s a good thing they are putting on another Teen Book Fest in 2011. The rest of the bookmarks we will give away on Twitter and Facebook this week, watch our feeds! Total your entries and leave them below. Click here to fill out the entry form. Giveaway ends October 8, 2010….Good Luck! Natural semi-precious gem stones have been my personal favorite for earrings. For years I had searched craft shows and stores for the perfect earrings to accent my wardrobe. I decided a couple of years ago to create my own designs. Semi-precious stone earrings were very difficult to find due to so many makers moving to glass/metal beads. I have made earrings for entire wedding parties matching the brides color scheme. Brides love them as affordable gifts as well as a momentos of their special day. I create all my earrings as if I am making them for myself. They are rich in color, natural stones, swaroski crystals and accesory items. This booklace is dark, fun and affordable. It is made with a 20mm teardrop clear with black swirls bead with a 6mm round black agate gemstone and 4mm bicone ruby swarovski crystal. Embellished with spacer and bead caps at one end. The opposite end has a 15mm oval onyx gemstone with 4mm and 8mm bicone ruby and black swarovski crystals and bead caps. Embellished with a heart charm with skull engraved. 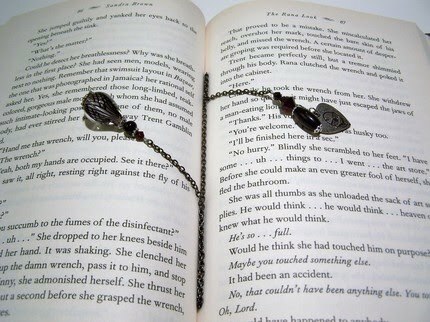 This booklace bookmark is perfect for paperback and hard cover books and will not damage binding. It measures 14 in from end to end.Booklaces are a perfect way to mark your favorite reads. It is also the perfect fun gift for all booklovers. Today’s Infinite Days giveaway is inspired by the necklace Lenah wears around her neck to remember Rhode and was donated by etsy shop StitchedForYou. I live in Port Washington, Wisconsin in the U.S. I graduated college with a bachelors of science in applied mathematics and also work as a tutor. I enjoy spending time with my husband, playing the cello, horseback riding, singing, cooking, making things by hand and playing with our dog Obie. We adopted Obie in August of 2008 when he was nine years old and underweight. He was not wanted by his old family who had him two years prior. We have no idea where he was before then. We love him so much and even though he is a senior dog, he has so much life in him, is so sweet and has great manners. Please support your local animal shelter! Additionally, my sisters Jan and Vivian are creative forces in this shop. Vivian makes jewelry and knits. Jan makes jewelry too. Be sure to check out their sections in the shop. 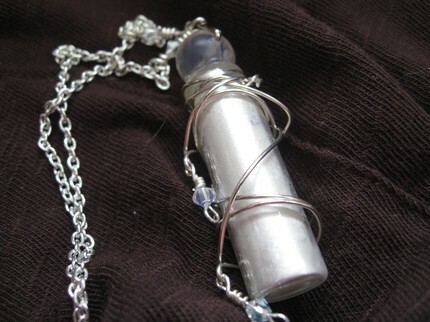 This necklace features a bottle of pixie dust wire wrapped with cut crystal beads. The pendant portion is about two and a quarter inches from top to bottom. The chain is twenty-one and a half inches long. Today’s Infinite Days inspired giveaway is a vintage version of the onyx ring I imagine Lenah wearing in her previous days as the Queen. Thanks to Etsy shop Beadedfashions for donating it! This ring is a chunky, fun, vintage style ring that definitely makes a statement! 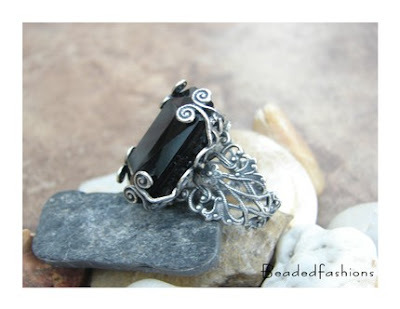 I made this ring from two pieces of oxidized filigrees that I formed into a ring band and setting for the large black onyx rectangle bead. The black rectangle bead is 1 inch in width and 1 1/2 inches in length. The ring is a size 9 and ready for shipping!